I was told to bring my lagg issue here as it's not supposed to be in the bug tracker. In the last 2 days i have been hit with an average of 5k ms latency. This is specific when connecting to your server as other Wrath and TBC servers don't have this issue. 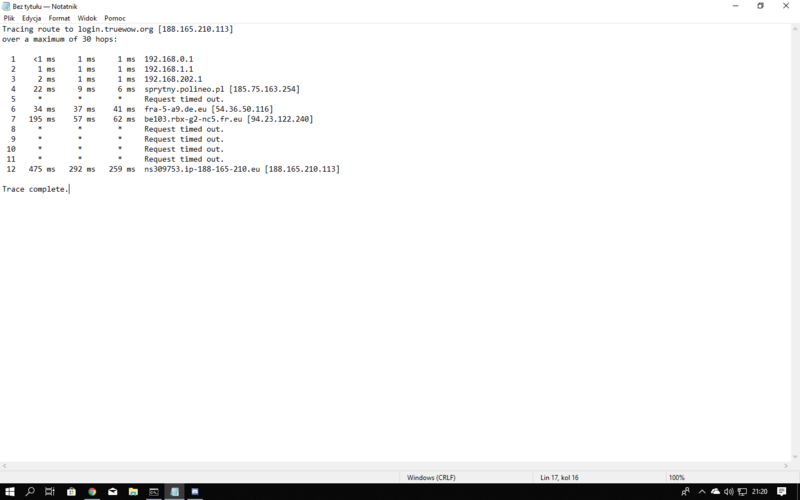 I have a screenshot of when i tried to run the tracert but it fails while trying to connect to things. Not sure how to attach screenshots in here so let me know how to and I'll toss it you way. Print screen the results to take a screenshot. CTRL + V in any Discord channel (preferably a private chat window) to upload the screenshot. Click the screenshot thumbnail to open it in a browser. Copy the URL/link and share it here. 4-5k ms all the time. Last edited by puchacz on 20 Mar 2019 22:02, edited 1 time in total. Post your trace results or we can't help you at all. Same here. Around 3k ms.
Havinfg a lot of lag the past few days. (c) 2018 Microsoft Corporation. Alle rechten voorbehouden. As Roel said here, everything should be fine now. Please re-check your gameplay quality now, all of you. If there are further issues, please report it in the thread linked above.